To start we will look at a picture of an eye. The main reason i want to briefly discuss this picture is to make you notice the capsule that retains the eye in the socket. You can see that between the outer skin and the eye itself there. 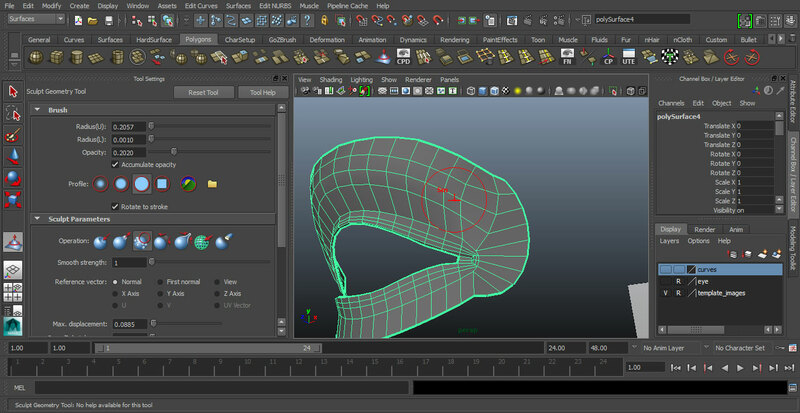 Normal methods for creating this topology involve extrusions from the skin outside which can get very messy when rigging, or have the eyelids separated from the rest of the skin. 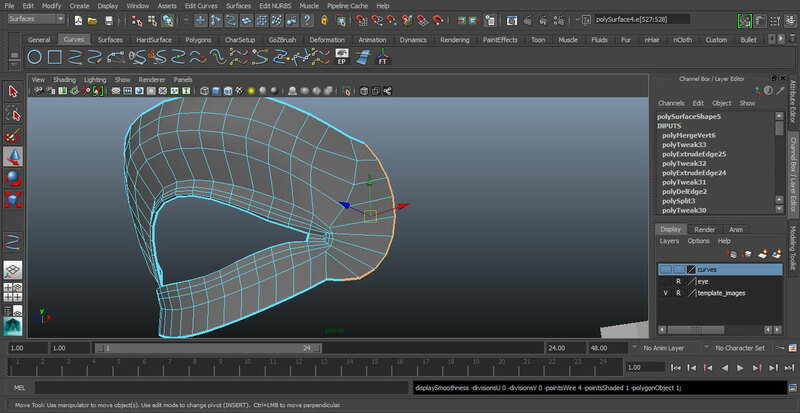 This second method is better for rigging but it makes difficult to get that flesh between the skin and eye right. It is also hard to get the tips where you see the eyelid muscles. Because both methods do not have that in between flesh, they require that you make an extrusion that surrounds the eye and extrudes backward n order to prevent that you see inside the character. 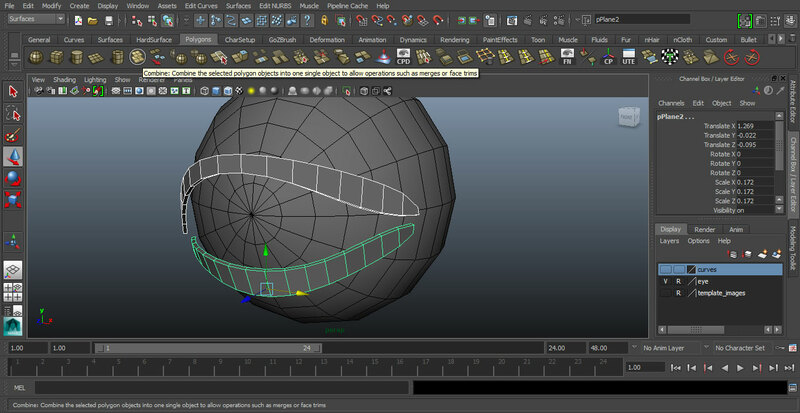 That ball can be a pain when you have to make your UV maps and when painting weights. 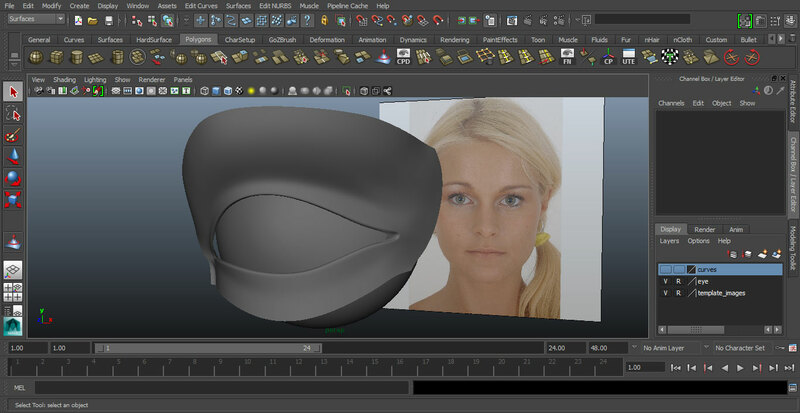 The method that I am about to show you creates that flesh that encapsulates the eye, it also lets the eyelid go down and match perfectly with the bottom of the eye without the need of complex rigging, remodelling or a high number of polygons. So without further chit-chat here is the tutorial. 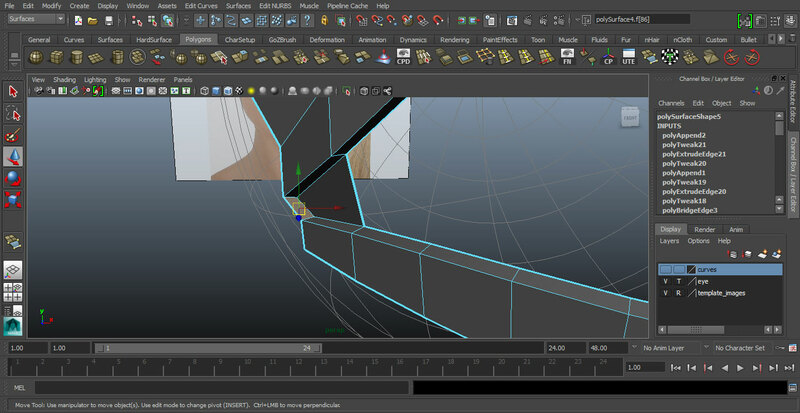 Although it is made with Maya, you can make it with any 3d modeling app because it is not focused on the tool but on the construction itself. 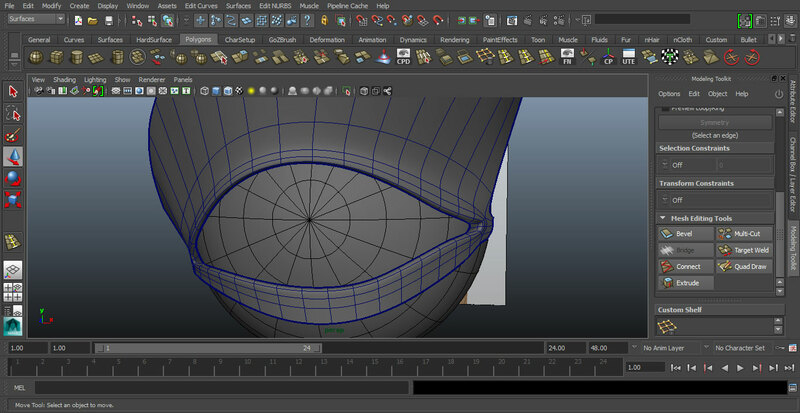 That means that this eye can be modeled with polygons, sub-divisions and even NURBS. I have screen-shots of the whole process so even if your English is not very good, you can still follow the procedure without missing anything. Step one if you want to make a human eye, choose a photo reference. All eyes are different and the generic eye does not really exist. 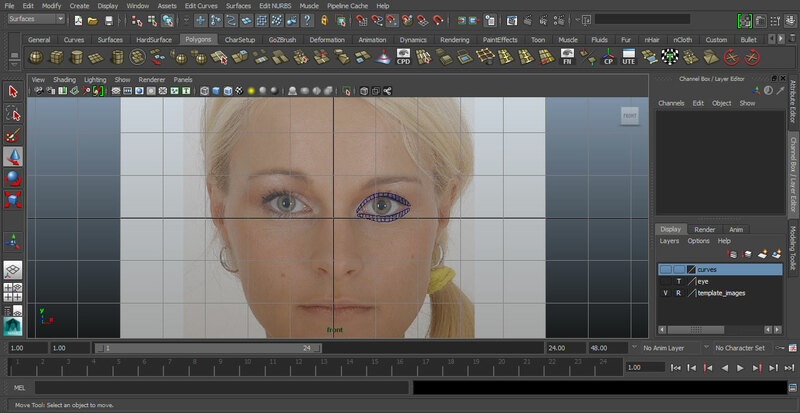 Usually a model becomes unrealistic when you make it generic, in this case the eyes. They lack any kind of individuality, which is what makes each person stand out. 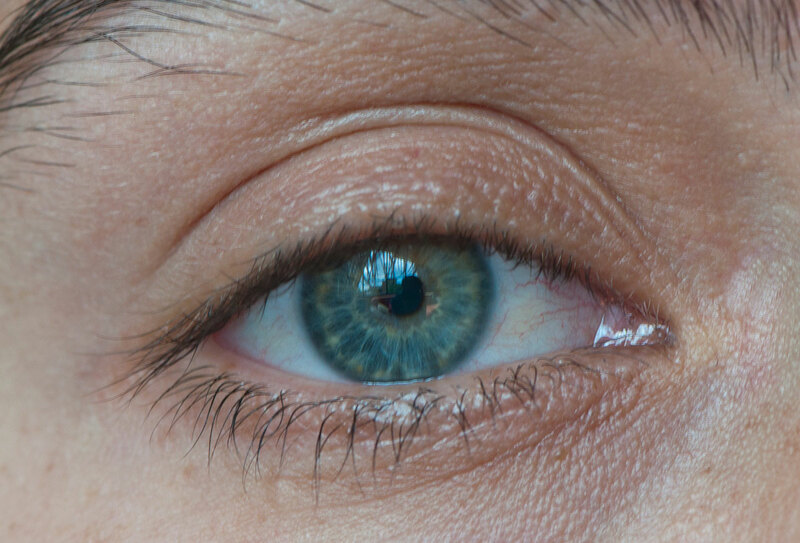 The main differences between eyes are the colour of the iris, the eyebrows but what usually gives the eye unique characteristics is the flesh that encapsulates it. Between the eye and the nose, everyone has different amounts of fat. In the picture above, you can see that the fat surrounds the top of the eye and you can only see a small part of the eyelid. Other eyes like mine have very little fat and you see a concave area between the forehead and the eyelid. Find an image for reference; if you are working on an animation/games project then use the concept art, and this method makes no difference if the eye is realists or cartoonie, the principles are the same. I got my image reference from here. It's called “mariah3angles”. Put the images accordingly in your program and begin to model. NOTE: Because I am only making an eye I am modelling with faces, but this also works if you model the whole head from a cube (like I do). If you are doing that then ignore this step. Model the superior and inferior arches of the eye. The area that is closest to the eye itself. 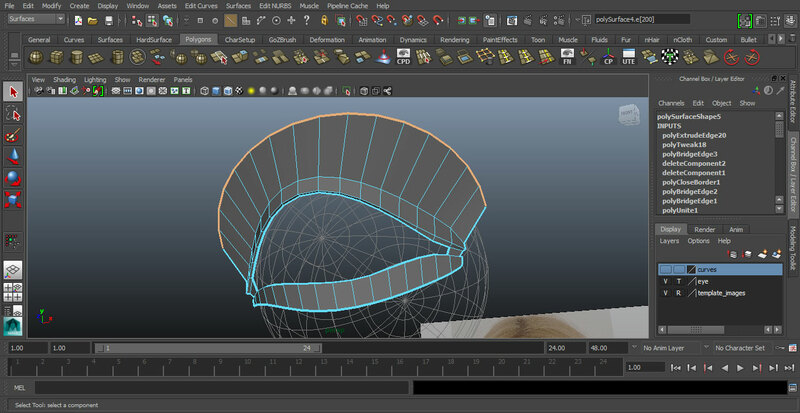 Make sure the curvature is correct in the three dimensions (This is for the newbies). 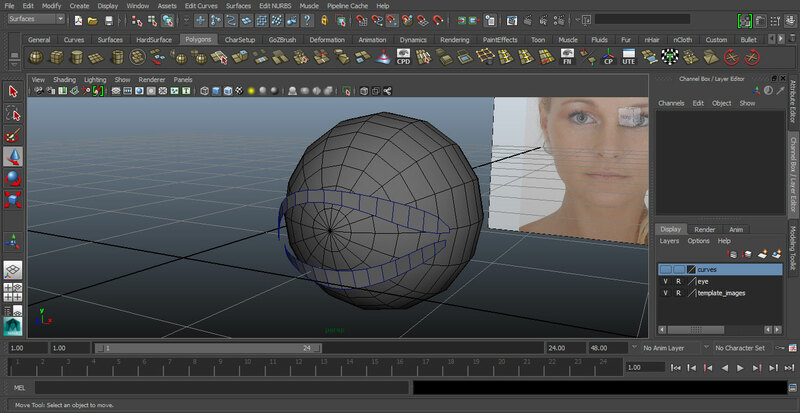 Now make a sphere and use it as reference for the eye. 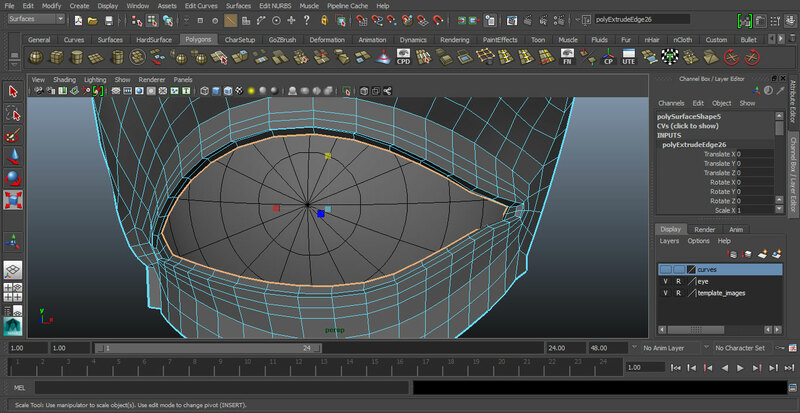 It’s a common mistake that you model an incredible eye but the overall curvature is wrong and your eye won't fit properly. 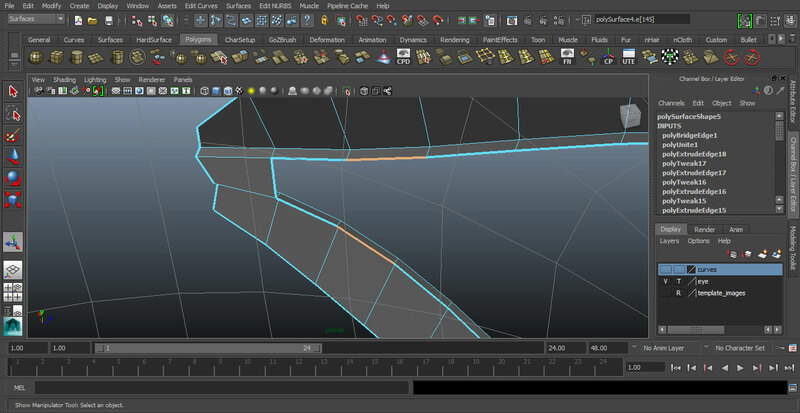 Select the top edge of both of your arches and extrude (extend) inwards just a tiny amount, like -0.02 in Maya. Be aware that the actual number varies and depends on the size of your model and program that you are using. The amount that you extrude corresponds to the horizontal plane of flesh between your outer skiing and the eyeball. COMBINE the 2 arches. Rotate you camera as to look from the inside, on this step it is useful to have double sided faces on. Go to the edges, select the edges and connect them (usually that is called the Bridge function). THIS ENDS THE FIRST PART AND EFFECTIVELY CREATES A SOCKET FOR YOUR EYE. Although the basic shape is right now we have to build the surroundings and create the muscle that surrounds the eye so later you can rig it. Extrude the top edge of the top eyelid. Adjust the edges to match the curvature if your reference images. 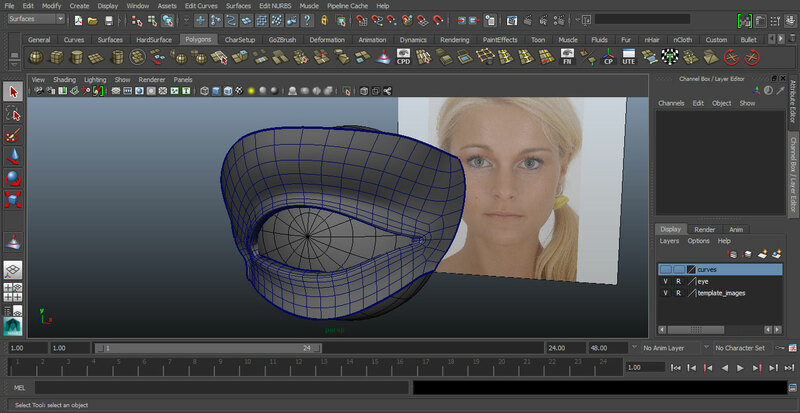 (You can ignore this step if you are modelling fro a box and you already have the head). At the edges, we need to unite the 2 eyelids. 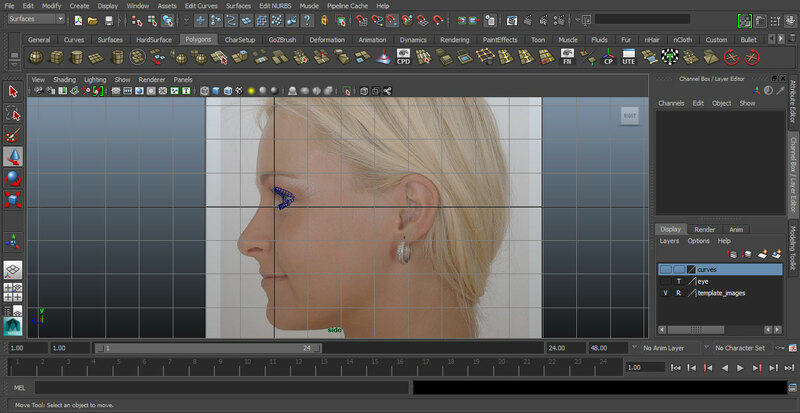 Create a polygon between the horizontal edges and the face you bridged before. 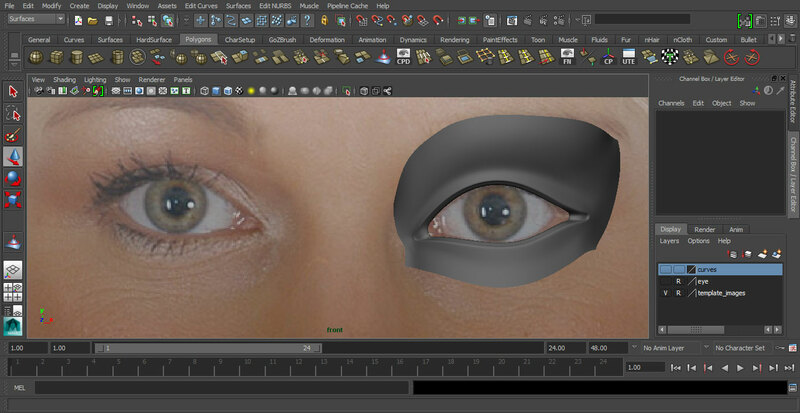 Select the last edges of your eyelid, including the one of the face you just created and extrude them (extend edges). Set your edge loop to create one at the middle and make one for the top and the bottom. 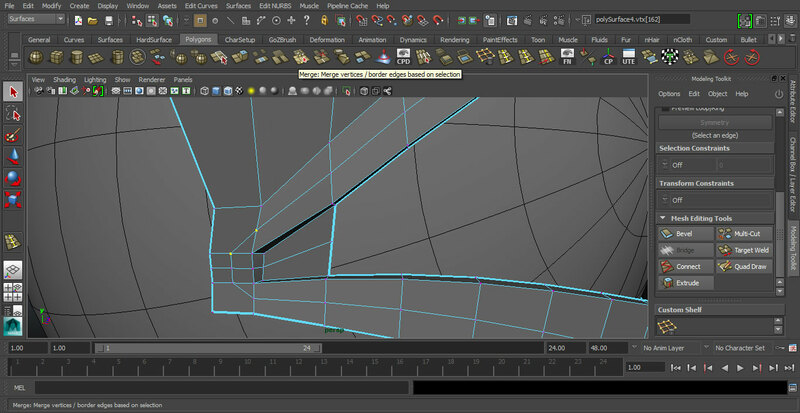 Using the split polygon tool connect the 2 edge lines that you just created. 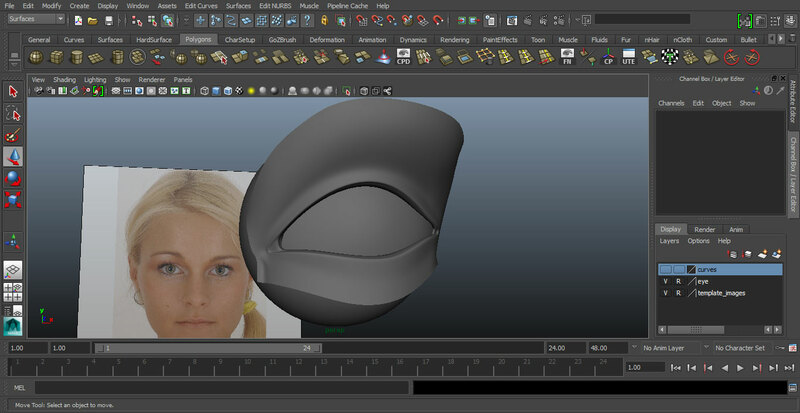 Now in order to remove the N-Gons we need another edge loop through the faces in between the 2 eyelids. 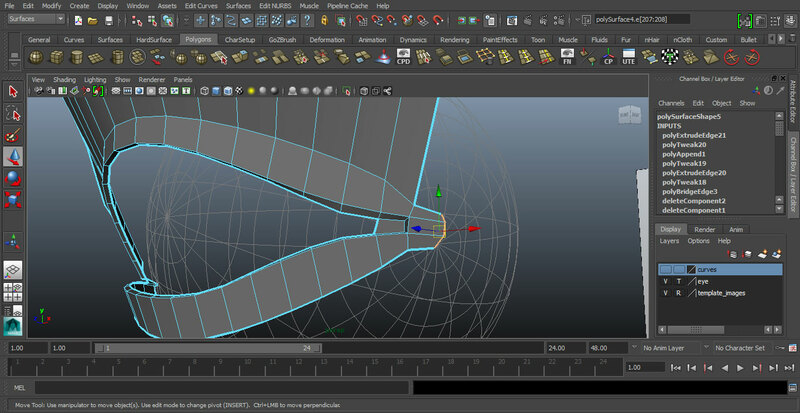 Select the 2 vertices of the triangles that you created when you joined the edge loops and merge them. You will delete the N-gon and return to a Quad topology. 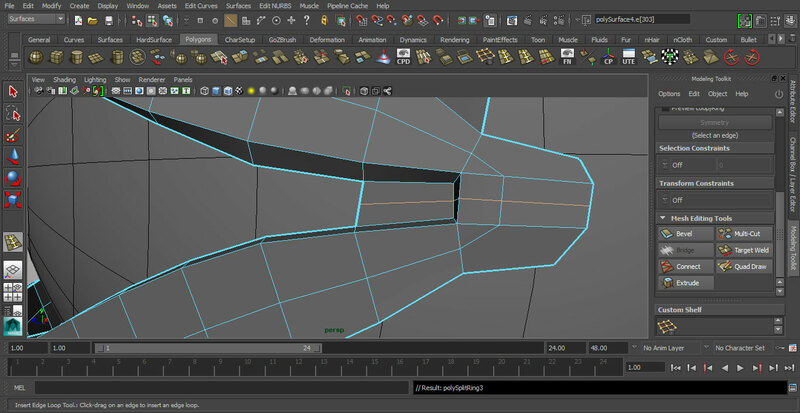 Inside the vertices you just merged, add another edge loop. Add another edge loop to the extrusion above the eyelid. Modify the geometry accordingly. 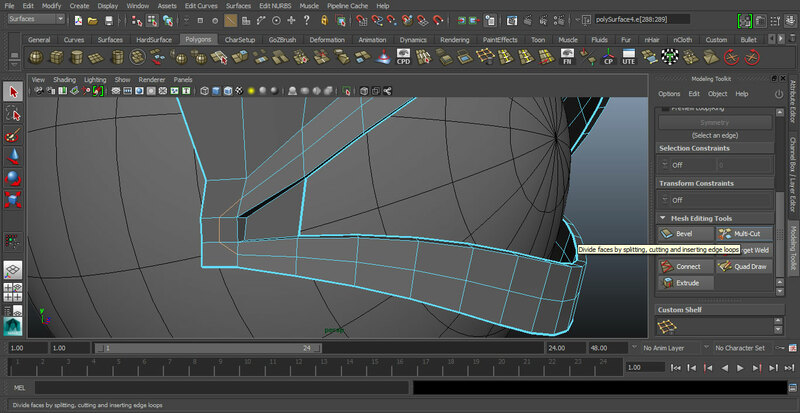 Bevel that edge to from the curvature of the eyelid. At the inner part of the eye take the inner edge and move it to form the beginning of the nose bridge. Do the same at the outer edge. This edges will form the side of the of the head. 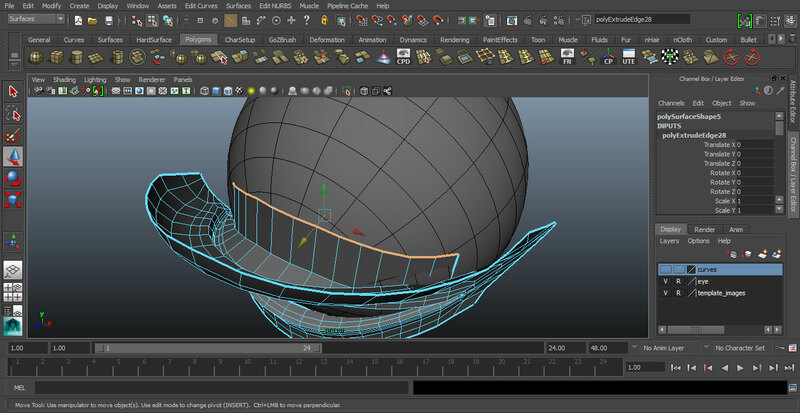 Take the bottom edge and extrude it like you did at the top. 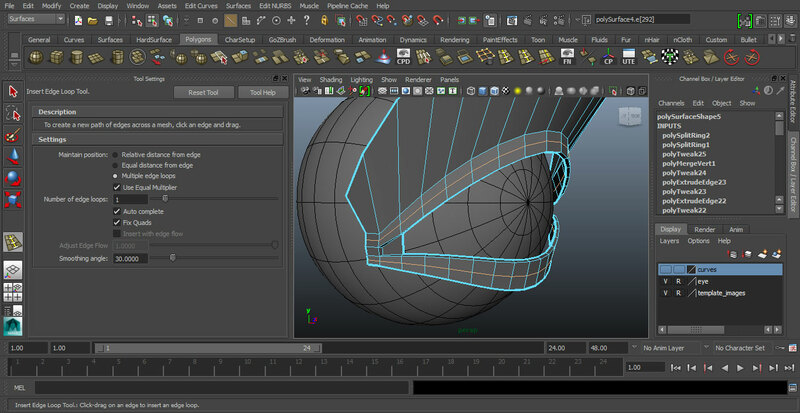 Move the vertices accordingly to fit your reference image. You should have something like this. 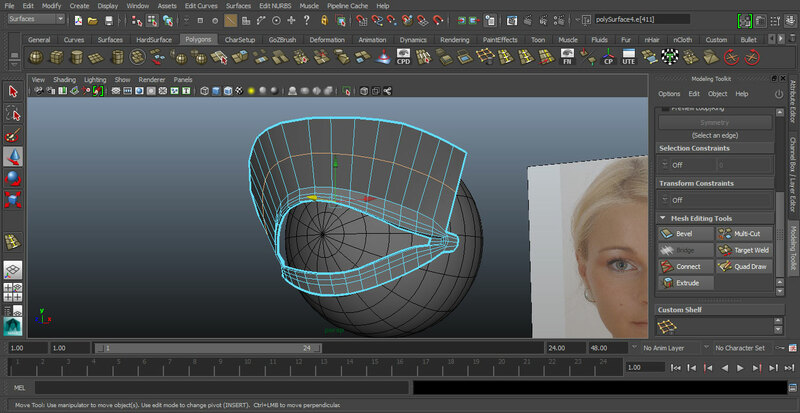 NOTE: The last 2 steps can be skipped if you are modelling from a finished head, leaving the eye to the end. Either way is fine and this will not affect anything. As you can see in this image, a very sharp line separates the inner eyelid to the outer parts. This is the folding of the eyelid. This is what makes a lot of the character of the eye. People of countries of Far East Asia, China, Japan, Korea, Taiwan, etc., have the eyelid to the bottom. 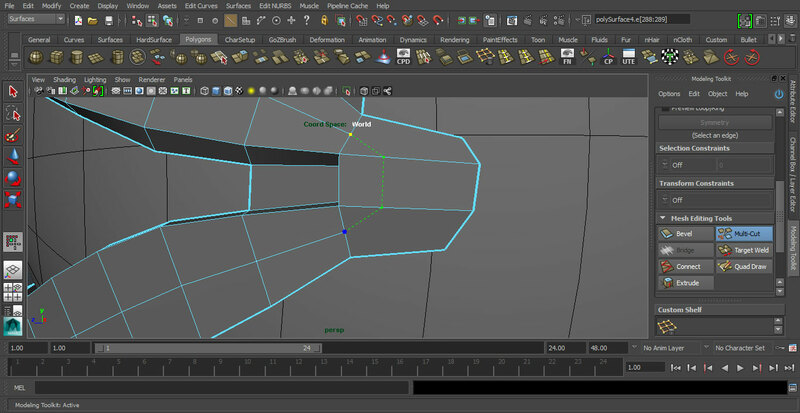 Consider this because it is very important in order to get the shape right. After smoothing the polygons, you should have something like this image. It is almost done. The only problem that you have is that there is a gap between the eye and the skin. We are going to solve this. 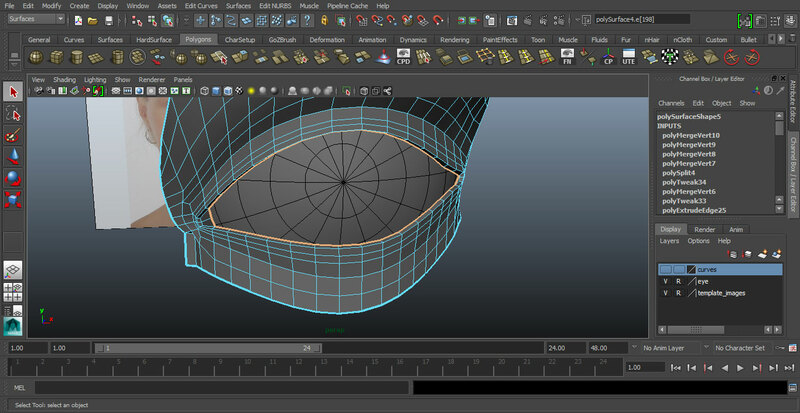 Select the inner edge inside the eye and extrude it backwards, towards the eyeball. 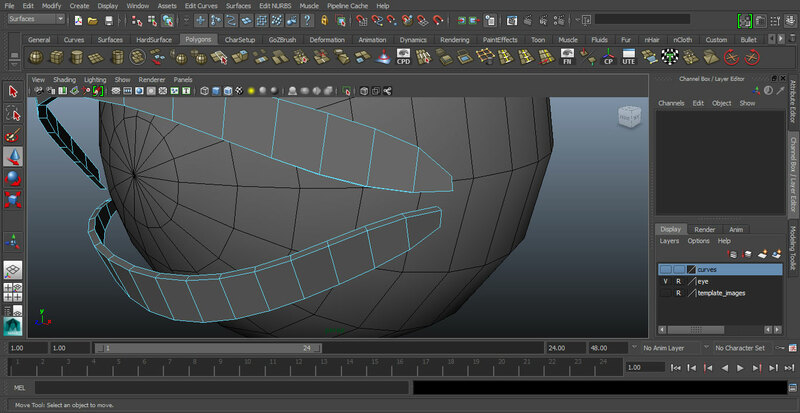 Move the vertices so that they follow the curvature of the eyeball. 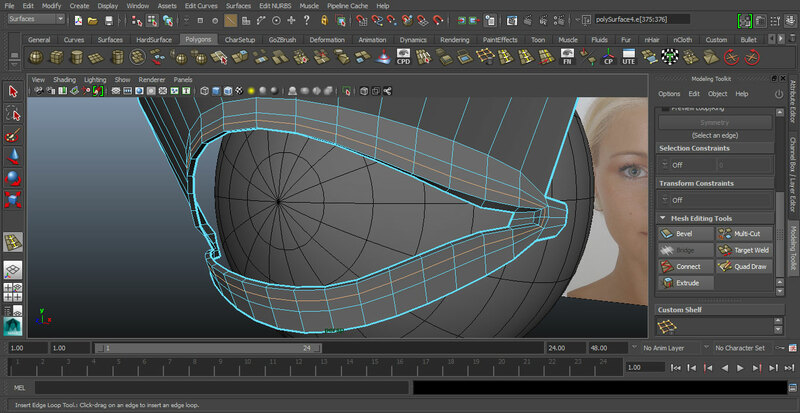 Now extrude the edge of the faces you just created and again make adjust them accordingly. And there you have it. 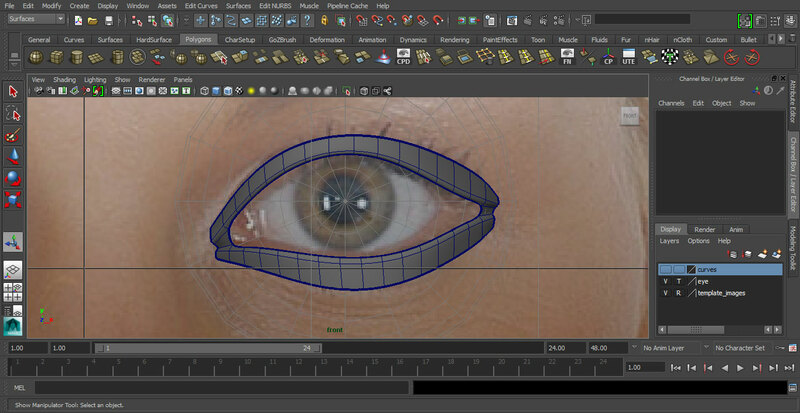 This eye construction method is quite easy. You can adapt it to all of your designs. 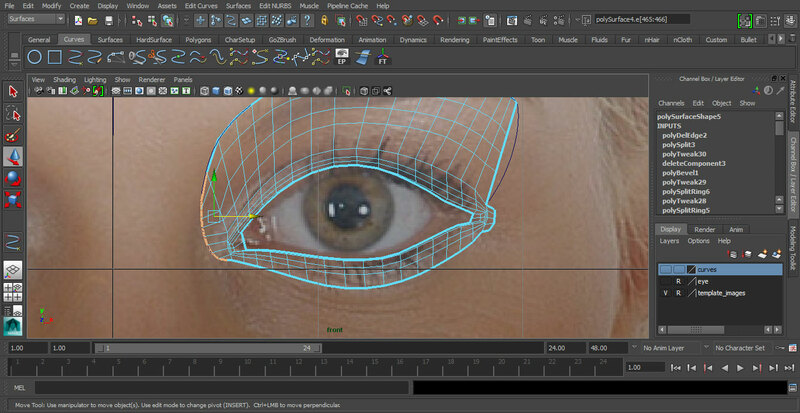 You can change the shape of the main curves of the eye depending on for reference pictures or drawings. Be careful when you are making animal eyes, as you might have to modify the geometry of the eye in order to make it accurately. Editor's note: Jorge Sanchez has a master's degree in animation and visual effects from the Academy of Art University in San Francisco, California. Since then he has mostly worked on video games and indie animation projects. He studied film at school, but his real love has always been animation. Check out his work at http://jorgesanchez3d.jalbum.net, and follow him on Twitter: @lafocapeloda.